SYLVANIA Slim Floodlights are developed to take advantage of the small size and high output benefits of today's LEDs. The simple mounting, IP66 rating and slim design allows the luminaire to be incorporated into almost any outdoor flood lighting application. 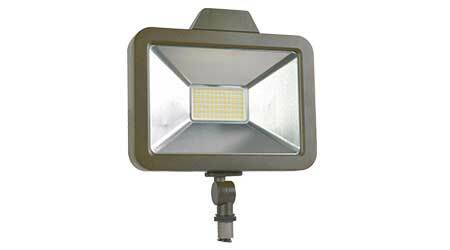 Producing up to 6000 lumens and 119 LPW, the Slim Floodlight exceeds DLC standard and premium requirements. Offering wide distribution and multiple output levels, the Slim Floodlight delivers up to 87 percent energy savings, has a 150,000 hours+ LED L70 life rating, and is RoHs compliant.